While Pratik Ghosh studies for the Illinois bar examination during summer 2017, he will also work as a Public Interest Law Initiative Fellow with the Roger Baldwin Foundation of the American Civil Liberties Union of Illinois. Pratik had joined Kirkland & Ellis in Chicago as a litigation associate but he first devoted 300 hours to supporting senior attorneys at the ACLU’s Chicago office on a variety of projects. For Pratik, the ACLU Fellowship program was a natural segue into his permanent position with Kirkland & Ellis. While earning his degree in neuroscience at the University of Michigan, Pratik worked as a liaison between clinical researchers at the University of Michigan Health System and residents of the underserved communities they sought to support with various community health initiatives. “My work with the health system was ‘translation research’—also known as ‘bench to trench.’ I helped the clinical researchers who designed community health programs and studies connect with the people they worked with,” he explained. Pratik enjoyed his work educating underserved communities about healthy eating, lifestyles and blood pressure, and his first-hand observations of the effects of health policy decisions and the systemic obstacles low-income families faced sparked his interest in studying law. To confirm his interest, he spent the summer before entering Vanderbilt working at the Michigan Poverty Law Program in Ann Arbor, where he reviewed hundreds of divorce cases to compare the outcomes of litigants who represented themselves in the proceedings with those represented by attorneys. Michigan Legal Help, a local legal aid program, used his research to evaluate the effectiveness of the resources the program provided self-represented litigants. “I liked law’s emphasis on analytical skills,” he said. 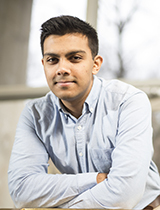 Pratik chose Vanderbilt because of its academic rigor and location in the Southeast. As a 1L, he discovered his strong interest in litigation in the Mock Trial Competition, in which he was a semifinalist. As a 2L, he entered the Bass Berry & Sims Moot Court Competition. He won the Best Brief Award, and he and his teammate, Neil Greenwell, were quarterfinalists. As a 3L, Pratik is a member of Vanderbilt’s Travel ABA moot court team and an associate justice on the Moot Court Board.